Can You Spare 90 Minutes For Brighter Teeth? Whitening procedures effectively restore the smile of people with stained, dull, or discolored teeth. 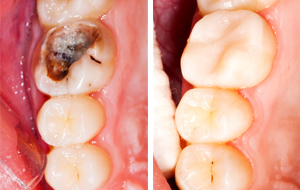 The darker tissue of your teeth, the dentin, can become exposed as the outer layer of enamel is worn away by the effects of aging or things like caffeine and tobacco. Coffee, tea and red wine are some major staining culprits. What do they have in common? Intense color pigments called chromogens that attach to the white, outer part of your tooth. Some commercially available "whitening toothpastes" can be somewhat effective at removing stains and making teeth a few shades brighter. However, many of these products have abrasive substances that can actually wear away your tooth's enamel. Whitening agents actually change the color of your teeth, but only are effective on certain types of stains. For example, bleaching agents have a difficult time removing brownish or grayish stains. These products also are not as effective on pitted or badly discolored teeth, or on restorations such as crowns, bridges, bonding and tooth-colored fillings (porcelain veneers or dental bonding may be more appropriate in this case).